The highlight of the evening was the induction of Willard Lewis, Class of 1945, whose running accomplishments were detailed by Graziano. The spry 86-year-old was honored with a standing ovation by all at the ceremony including 44 Lewis family members and friends. 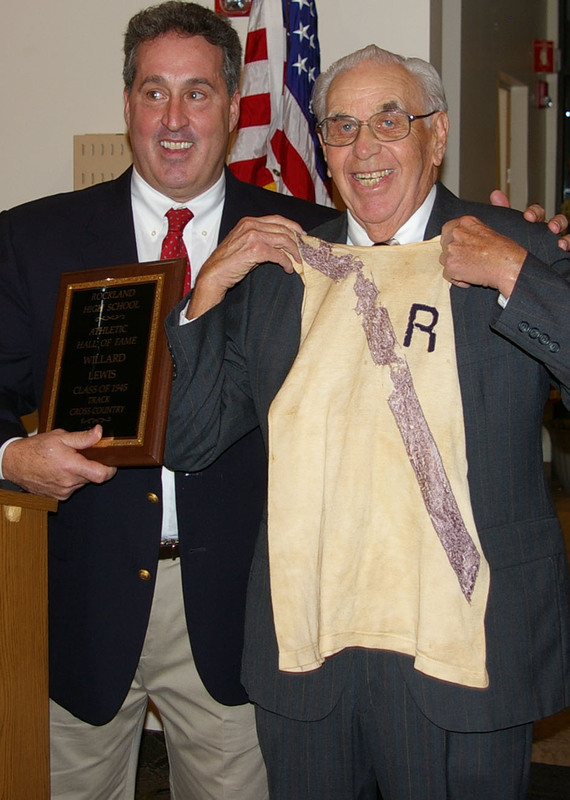 Willard Lewis, Class of 1945, shown with his cross country jersey from high school. Presenting Lewis with his plaque is Athletic Director, Gary Graziano. Peter and Paul Hoss, Class of 1965, track and cross country stars who were presented by long time RHS cross country coach, Charlie Leverone. Leverone said the Hoss twins got their start in running by chasing the farm animals on their 20-acre farm on Summer St. Hailing from a family of ten siblings, both Hoss brothers went on to star in track in college at BU and UMass Amherst. Donna Girouard Rinella, Class of 1967, presented by classmate and friend, Jane Killinger. Girouard led her basketball teams to two league championships and held the single game scoring record of 36 points for many years. Killinger described Girouard as the girl that all the boys wanted on their team and said Girouard paved the way for the recognition of female athletes at Rockland High School. Steve Owen, Class of 1972, presented by longtime RHS boys basketball coach Bob Fisher. Steve captained his 1972 basketball team to a state championship and amassed 1,021 rebounds in his high school career. Fisher also recognized the four Owen brothers, Ken, Wayne, Andy and Steve who excelled in athletics at RHS in the 60’s and 70’s. Ken was inducted into the Hall of Fame in 1993. Mark Laramee, Class of 1998, presented by former coach Ken Leer. Leer could not attend the ceremony but his presentation speech was read by Graziano. Laramee’s wrestling accomplishments included four state championships in four different weight classes and one All-New England championship. Laramee is also a member of the National Wrestling Hall of Fame in Stillwater, Oklahoma. Liz Lima, Class of 2001, was presented by former coach Peter Woodward. Lima excelled in soccer at RHS and is now a successful club and high school girls soccer coach at Notre Dame Academy, recently leading her girls to a state championship. Lima, also an outstanding student graduated from Harvard University. Woodward described Lima’s indomitable spirit as her guiding character trait, which Lima herself attributed to her family and to Bulldog pride. Steve Owen, right, was presented with his Hall of Fame plaque by former RHS basketball coach Bob Fisher. Fisher outlined Owen’s outstanding abilities and leadership bringing the team to the state championship in 1972. Fisher also described Owen as the best rebounder in RHS history with 1021 rebounds in his high school career. Graziano, Liz Lima and former RHS girls soccer coach Peter Woodward. Woodward presented Lima as an outstanding soccer player at RHS and described her indomitable Bulldog spirit and pride. Athletic Director Gary Graziano, Jane Killinger and Donna Girouard. Killinger introduced Girouard and detailed her outstanding accomplishments in athletics at RHS from 1964 to 1967. She also called her a pioneer in the recognition of female athletics which was accomplished with the passage of TitleIX legislation in 1972. Long time track and cross country coach, Charlie Leverone introduced Paul Hoss, Class of 1965. Paul and his brother Peter were outstanding runners at RHS. Leverone described how they got their start chasing the animals on their 20 acre farm on Summer St.
Mark Laramee, Class of 1998, was a four time state champion in wrestling and twice won the title of All-New England. He is shown here with wrestling coach, Tim Cullinan. Peter Hoss with former RHS track and cross country coach Charlie Leverone who inducted Peter and his brother Paul, Class of 1965, into the RHS Athletic Hall of Fame.